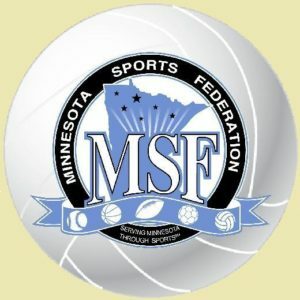 Since 1982 the Minnesota Sports Federation has conducted an adult volleyball post season tournament program second to none, both in terms of cost and quality. The MSF $16.00 winter sports team membership fee is the lowest in Minnesota considering the benefits provided. Despite some adjustments for inflationary costs, the MSF still provides the lowest tournament entry and membership fees available, especially considering the number of games guaranteed. Prestigious and attractive tournament awards. Individual awards to state champions and finalists. Top notch playing facilities (see tournament schedule). Experienced tournament personnel and quality game officiating. Membership in an organization which provides voting and board membership rights to the independent league director/team manager, as well as the leisure professional. Unlike other organizations, all fees which are collected are used solely to provide amateur/recreational sports programs. This enables the Sports Federation to provide the greatest service at the lowest possible cost. By comparing our tournament formats, number of games guaranteed and entry fees with other organizations you will see the Sports Federation not only provides teams more games, but also at a lower cost. This is possible because all fees collected go directly back into amateur sports programs. The above advantages are just a small sampling of the membership benefits which make the MSF the premier sports organization in the state of Minnesota. Guides, rulebooks and rosters are available after November 1 and may be obtained in advance of submitting team membership forms by calling (952) 405-6936 at Federation offices with your request. One complimentary rule book will automatically be sent to each league which requests books. Please remember to forward your team membership forms at an early date and add the applicable shipping fee even if you called us with your book request. The team membership deadline is January 5. As you know, the Minnesota Sports Federation provides you with universal regular/post season roster forms for all member teams from your community. Rosters are provided free of charge but due to their three-part format are expensive to produce so please do not order more than necessary. The deadline for submission of regular season rosters is February 25. A reminder that the MSF invites your attendance and input at all directors’ meetings. Please call MSF offices for the site and time if you are interested in attending. At your request we would be happy to attend your league meeting to present the Sports Federation program to your team managers in greater detail. Please contact us if we can be of assistance. In closing, we are confident that if you compare our fees, tournament formats, awards and services to those offered by other organizations, you will find the Sports Federation’s fees lower, its programs better and services greater.